Jim Mahfood is returning to comics, and specifically to his creator-owned Grrl Scouts, for a new series at Image called Grrl Scouts: Magic Socks. Mahfood made a splash in comics back in the late '90s, with a very graffiti-inspired style of cartooning that was entirely unlike anything we were used to seeing in comics at the time. He hit it big drawing Clerks comics for Kevin Smith, and then went on to draw some fun Spider-Man stuff for Marvel, as well as publishing previous volumes of Grrl Scouts at Oni Press. We don't have any interior art yet, but Mahfood's cover for Grrl Scouts: Magic Socks #1 is in the Sienkiewicz-esque art style that Mahfood has been working in recently, rather than the classic Grrl Scouts aesthetic, so it'll be interesting to see what the story itself looks like. Working on Grrl Scouts: Magic Socks has been an absolute blast for me, the most fun I've had doing comics, without a doubt! The freedom that comes as a creator working with Image Comics can't be matched anywhere else. The end result is, we the creators get to go completely buck wild, have fun, and express ourselves in the purest way possible. And that fun is evident on the printed page. I hope readers will be willing to go on this bizarre and eye-poppin' adventure with me. 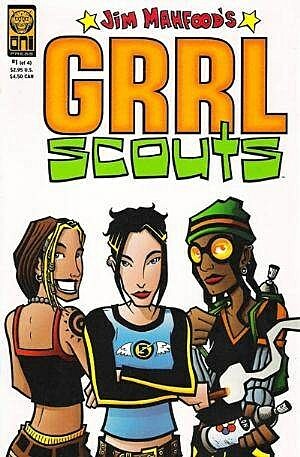 This is just the beginning of what I plan to do with the Grrl Scouts comic book universe. Grrl Scouts: Magic Socks #1 also features a variant cover by Skottie Young, below, and comes out May 17.